At a time where almost everyone owns a smartphone, a mobile app is a sure way of reaching out to consumers. With 70% of the world’s population– nearly 6 billion people- owning smartphones, a well-designed mobile app can benefit your business in many ways. Creating mobile apps is not everyone’s job. This explains why most organisations are willing to pay top dollar to app development agencies. So, here are some reasons you should enlist the services of an app development agency, when creating an app for your business. App development agencies specialise in app creation. The fact that they focus on only one thing ( app development) means that they are in a better position to do a better job. This gives them an upper hand over an in-house team of developers, who have their attention spread across multiple jobs. On that note, an app development agency also frees up some time for in-house developers– and allows them to focus on core business operations. In any business with an in-house tech-department, tech people do almost everything. They can help you with networking issues, setting business emails, or some hardware repair tasks. While they might have some knowledge in app development, it becomes somewhat tricky for them to handle the demands of app development jobs, effectively. 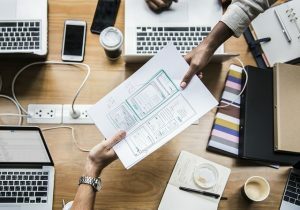 Turning to an app development agency means relying on professionals that have dedicated their careers to creating apps, and this improves your chances of getting the best possible app design. Most app development agencies have project managers, who coordinate the stages of app development. One significant benefit of working with mobile app development agencies is that they offer dedicated project managers, who not only oversee the app development process, but also communicate with the client. Working with a project manager means more centralised communications and less stress, since everyone is the on the same page. App development is a never-ending process. Any app needs a series of updates, as the business grows, over time. Some of these changes are meant to spruce things up and improve its functionality. For that reason, it is highly advisable to enlist the services of an app development agency. Unlike relying on a freelancer or an in-house developer, who might soon move, in pursuit of greener pastures, an agency will always be at your service, as long as you need to work on your app. When developing an app, it is imperative to ensure that it’s compatibility with the leading smartphone platforms, such as Android and iOS, remains intact. Thus, working with the best app development agency means leveraging on the best technologies, ensuring that your app is compatible with popular platforms. Also, using the best technology means using the best tools and resources, which give your clients an efficient and user-friendly app. As you have seen from above, it is advisable to enlist the services of an app development agency if you are planning to develop an app for your business. This means enjoying top-notch services, right from the onset, when the app is designed, to the time it gets to the market. Working with professionals means that your app will not only look good, but you will have the much-needed technical support to make your app relevant and successful, for many years to come. Copyright © 2019 fusioninformatics.com.au. All Rights Reserved.